As a relatively cheap and versatile option they can be both practical and decorative to use in creating a relaxed, country or festival vibe for your wedding day, hay bales seem to be standing the test of time in terms of wedding decorations. 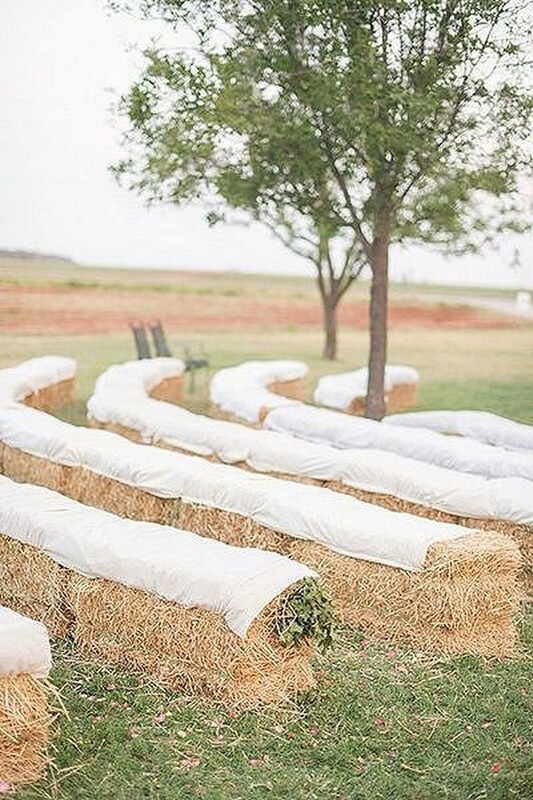 Today I’ve rounded up some great hay bale wedding decorations and hope you can find your dream ones. As we all know that wedding reception plays a very important role in the whole wedding planning, giving both guests and the couple a memorable spot. To set the basic tone for the reception, you may need to decide your wedding theme first, like if you want a rustic themed wedding, a backyard wedding reception will be the perfect choice, or if you want a traditional wedding, having your reception venue set at a ballroom can be really amazing. Or if you don’t have so many ideas in your mind, check out these gorgeous wedding reception ideas and steal one as your own reception. Down to earth, natural and outdoorsy but still sophisticated, this is what a rustic wedding show me. I fancy this wedding theme, with every details inspired by nature, which has a perfect match with barn weddings, backyard weddings, country weddings, or woodland weddings. There’re many diy projects that can be done in advance and the simplicity of the details lend itself for friends and relatives to help. Also, if you have limited budget, a rustic wedding is a good choice with a lot of cost savings. Here’re some great rustic wedding ideas for your reference.